Proper pest management results in good seed or grain quality. 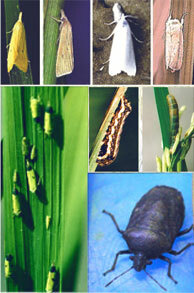 Damage by insect pests and diseases results in uneven sizes and discolored grains. If there are plenty of weeds, there is greater mixture in the harvest. There are also more biomass that could impede land leveling and preparations in the next season. Pest Identification. If a pest or disease and its management cannot be identified, call the attention of the pest specialist (entomologist/plant pathologist) or a team of pest specialists to properly identify the organism and decide on the appropriate course of action such as the use of pesticide, biological agent or cultural management. No significant yield loss due to insect pests, diseases, weeds, rats, snails, and birds. Significant pest damage occurs when one or more pests cause damage as described in Table 4, Table 5, and Table 6. Use varieties resistant to pests prevalent in the locality. The use of resistant varieties is the first line of defense in pest management and is compatible with biological control. Change or rotate varieties every 2 to 4 croppings to disrupt insect pest and disease adaptation, thereby preventing build up of virulent pathogens and insect pests. Conserve beneficial organisms. There are rich communities of beneficial organisms in the rice ecosystem in the absence of natural-enemy killing pesticides. The indiscriminate use of pesticides reduces biodiversity and disrupts the natural balance of insect pests and beneficial organisms. Conservation of these beneficial organisms is safe, economical, and permanent. For example, long-horned grasshopper feeds on the egg mass of stemborers while spiders feed on the nymphs and adults of leafhoppers and planthoppers.